The interface resembles Apple’s Clips app a lot but does more than that. It works using the cloud, which results in accessibility of images and videos from any device, be it Windows, Android or iOS. The whole process synchronizes to the cloud, even the process of creating a story. It results in no obstacle in completing the work even if someone has to change the device or operating system. 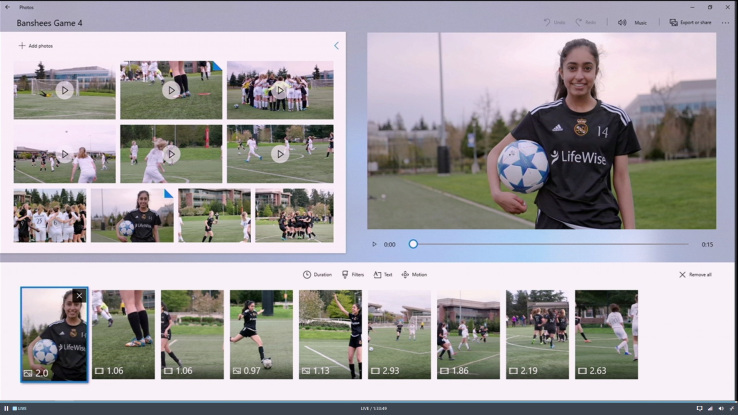 Microsoft has taken a great step for amateur content creators to create professional looking contents which is auto created by the mixing of photos and videos along with background music and neat transitions using AI(Artificial Intelligence). The application can recognize faces, which helps to go deeper in the video or change focus when it is needed. It can also change focus when there are multiple faces in the video. Microsoft claims that its AI is capable enough to understand the emotions of the video and deliver a nice output. Windows Story Remix is still in beta and will be available in later part of the year in the Windows 10 Fall Creators update. However, Microsoft will release a simpler version of this named ‘Photos’s, which will be available from May 11th as part of the first Windows Insider Build for the update. The new Windows Story Remix is clearly highlighting the amount of hard work that Microsoft is putting behind improving Artificial Intelligence. Along with that, the upgrade was also very necessary, as it has been long since Windows updated its Movie Maker. However, it is not completely suitable for professional projects but it can surely help the masses to make videos for personal use and social media.